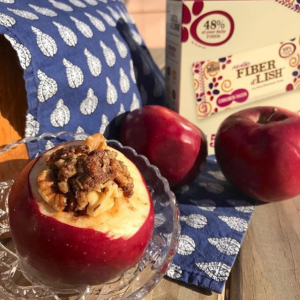 We recently ran a recipe contest with nine Registered Dietitians! 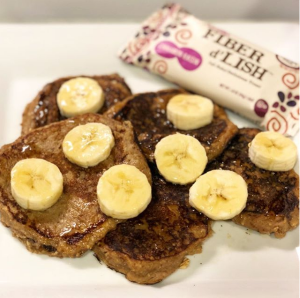 They were given our Cinnamon Raisin Fiber d’Lish bars and asked to create a delicious vegan recipe. They came up with some great recipes that we are excited to share! Carefully carve out the tops & seeds of four apples. 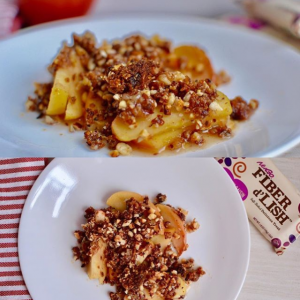 Mix together in a separate bowl the chopped walnuts, maple syrup, ground cinnamon, nutmeg, ground cardamom, medjool dates & Fiber d’Lish bar. Prepare a flax egg by mixing 1 tbsp ground flax with 3 tbsp of water. Refrigerate the mixture for about 15 minutes. Preheat oven to 400 F. Prepare an 6-cup muffin tin with cooking spray or paper liners. In a large bowl, mix whole wheat flour, brown sugar, baking soda, baking powder, nutmeg, cinnamon, and salt. Add flax egg, almond milk, canola oil, and mashed banana to a medium bowl, mix well. Add the wet ingredients to the flour mixture. 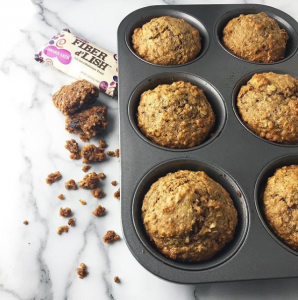 Add oats, quinoa flakes, and Fiber d’Lish bars. Mix until ingredients are evenly incorporated. 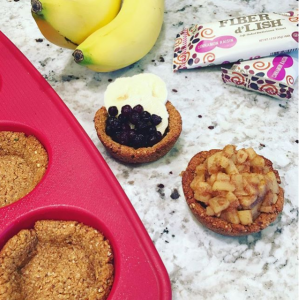 Add 1/4 cup of the muffin batter to each prepared muffin cup. Bake for 20 minutes or until a toothpick inserted into the center of the muffin comes out clean. Serve warm or keep refrigerated for up to 4 days. Toss apples in lemon juice then transfer to a 8×8 baking dish, lay out evenly and set aside. 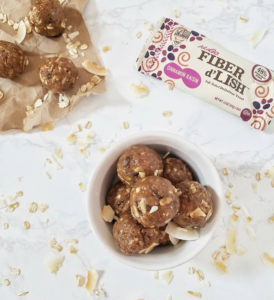 In a food processeor, pulse together NuGo Fiber d’Lish bars and hazelnuts. Transfer to a bowl and stir in maple syrup and coconut oil. Top the bar and nut mixture over the apples evenly. Bake for 40-45 minutes or until apples are softened and sizzling. 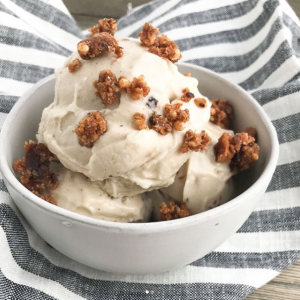 Serve with your favorite non-dairy ice cream or yogurt! Oil your pan and pour 1/4 cup of the mixture into the pan and cook 2 minutes on each side! Freeze for at least 2 hours or overnight. Place bananas and cinnamon in a food processor and blend until smooth. 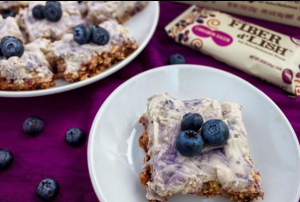 Fold in the crumbled NuGo Fiber Cinnamon Raisin bar pieces. Add whatever topping you would like such as fruit, cooked cinnamon apples, banana ice cream etc. In a food processor, pulse the crust ingredients and press into a 8×8 pan. Blend together the cream ingredients, and spread over the crust. Allow the bars to set in the freeze for at least an hour. Slice open grapefruit and prepare each triangle to eat by gently slicing around them. Line a baking sheet with foil and place prepared grapefruit under the broiler for 3-5 minutes. In the meantime, whip up the vegan coconut whipped cream. The night before, place a can of coconut cream in the fridge. Remove from fridge and transfer the hardened cream to a large mixing bowl. Use a hand blender to whip for 2-3 minutes until small peaks form. Sweeten with 1 tbsp maple syrup if desired. 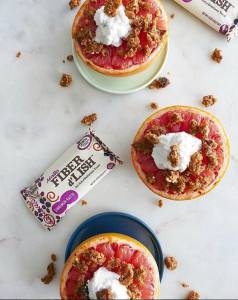 Top each grapefruit with a dollop of whipped cream and crushed NuGo Fiber d’Lish cinnamon raisin bar! Unwrap the bars and place in a mixer or food processor to break up. Once broken up all all other ingredients and mix till incorporated. Roll into 1 inch balls and place on a sheet pan or plate. Place in freezer to set about 20 minutes. 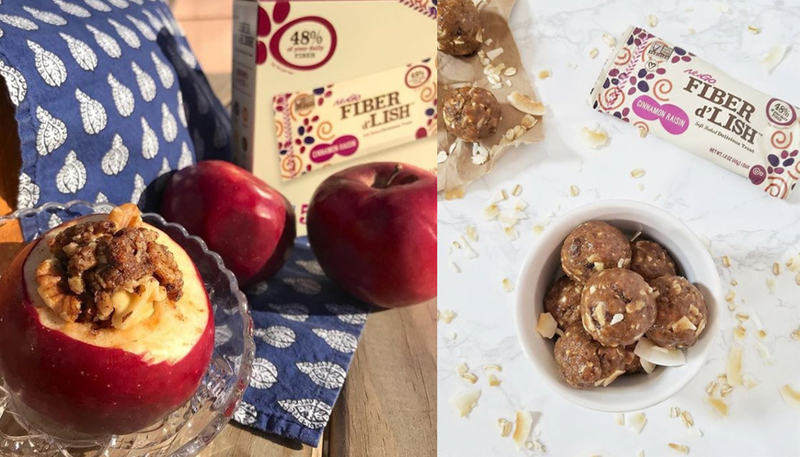 Crumble your Nugo Fiber d’Lish bar onto a baking sheet into small bite size pieces. Bake the granola for about 15 minutes until it begins to look toasty. It will feel soft when you first take it out of the oven, but as it cools it will become crunchy. While the granola toasts, blend all ingredients (except the granola bar) in your blender until combined. Divide the mixture evenly between two mason jars (a little over 1 cup in each). Add 3 Tbsp of chia seeds into each jar. Close the jar and shake to distribute the chia seeds. 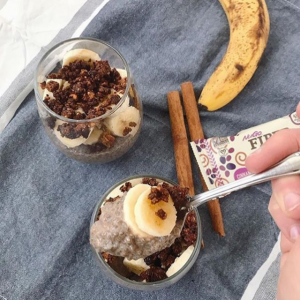 If the chia seeds stick to the sides or lid, use a spoon to scrape them down and mix together. Let sit for ~5 minutes to allow the chia seeds to absorb the liquid and become a pudding like consistency. When the pudding is set and granola is toasted, sprinkle the granola on your pudding. Top with bananas, or other fruit if you’d like – Enjoy!